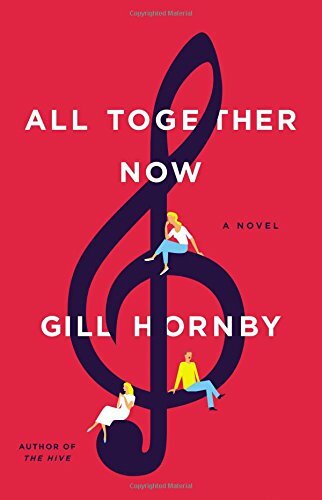 Gill Hornby’s second novel, All Together Now, hits just the right chord for a light, fun read. Set in a struggling small community near London, this quirky musical romp is rife with people attempting to harmonize while collapsing into discord. The Bridgeford Community Choir has been around for “eons,” and many of its members have been around much longer than that. The choir’s signature bit is the “Sound of Music” medley. The title of their last proper concert was The Magic of Les Mis. When their director is critically injured in an auto accident on the way to choir practice, what little structure they have is lost. Then it becomes even more important that they enter and win the County Championships in honor of their fallen leader. This won’t happen unless they get some new choir members—and quick. Enter Tracey, who after being auditorily ambushed on the corner is then literally ambushed and forced into choir duty by Annie and Lewis. Annie is a long-time choir member, who’s the first and last to arrive for choir practice. Lewis brings his wheelchair-bound teenage daughter to choir practice which may be the only reason he shows up—because singing is not one of his long suits. Jazzy, another of Annie’s recruits, is a young girl who dreams of fame and works at the local diner. And then there’s Bennett St John Parker, who is perhaps the most likeable of the book’s characters. He’s lost his job, his wife, and what little self-respect he may have once possessed. His most recent accomplishment is the addition of a clothes rail to his bedroom in lieu of a wardrobe—seeing how his soon-to-be ex wife has taken most of the furniture. Much of the story is centered around Tracey. While Tracey is for the most part sarcastic and unpleasant, people seem to like her. This is a testament to Hornby’s ability to develop complex characters within the constraints of a lighthearted, pleasant read. All Together Now is a humorous novel of poignant human dynamics. It’s a novel that celebrates song and the joy of music. Hornby gets in her digs against urban society, social complacency, and big-box consumerism while casting a set of characters who, while a little difficult to keep track of, entertain and pull what plot there is along. While not solving any world problems, All Together Now is refreshing and entertaining, perfect for that warm beach or cozy fireplace.